Rachelle Welti first started coming to Blackburn Dental Group as a patient as a young child. 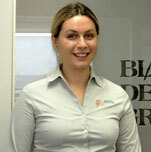 In 2013, Rachelle started her Doctor of Dental Surgery degree at the University of Melbourne. She felt strongly that exposure to a dental practice would greatly benefit her in her studies and she initially obtained a dental assistant position at Blackburn Dental Group. At the end of 2016, Rachelle graduated and began her new dentist role at Blackburn Dental Group. As part of her course, Rachelle has had the opportunity to work in many clinics including some in rural areas under supervision providing services in all aspects of dentistry. In 2015, Rachelle visited Cambodia as a volunteer dentist. Rachelle has special interests in paedodontic and conservative dentistry. She is currently involved in a research project at the Royal Children’s Hospital investigating decay risks in children with cerebral palsy.